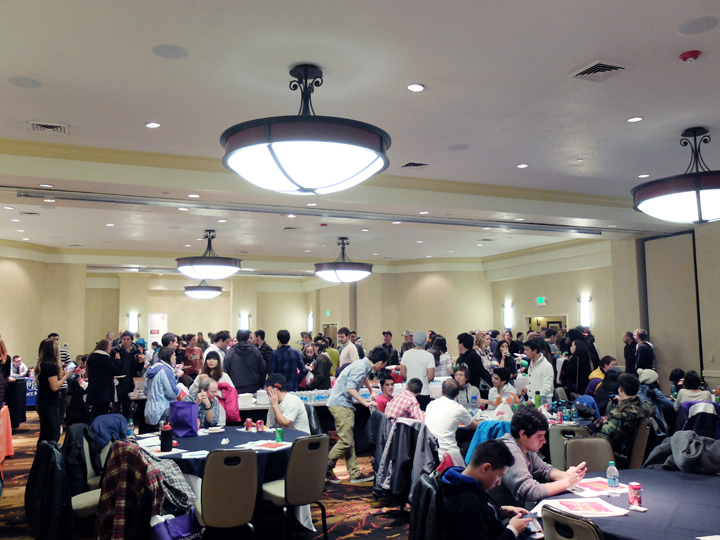 On December 19, 2014, J-1 Work & Travel participants living in Park City, Utah, were given a special welcome party at the Park City Marriott. The three largest employers of seasonal workers in the area, Deer Valley Resort, Park City Mountain Resort and the Canyons Resort, teamed up to host a 3-hour welcome party for seasonal workers in the area. Hundreds of pizzas were ordered in preparation for the nearly 500 attendees at the event. Park City Mayor Jack Thomas kicked off the event by telling the seasonal employees how important they are to the working order of Park City. Then, participants were encouraged to check out the information booths set up around the room. Present at the event were representatives from local banks, transit, police, J-1 Visa sponsors and other employers. Winter Work & Travel USA participants dominated the room and took home many of the raffle prizes offered by InterExchange and other J-1 Visa sponsors in attendance, as well as local businesses and the Park City Chamber of Commerce. The party charged on until after 11:00 p.m., with seasonal workers and Park City locals all dancing to DJ sets and enjoying the night.